Data is the lifeblood of every business, irrespective to the size of the business. With Advanced Online Backup services from AwesomeCloud, you can offer cloud-based backup as a white label service to secure your clients’ trust and further extend your status as their trusted advisor. Powered by Double-Take RECOVERNOW™, AwesomeCloud’s Advanced Online Backup service provides same-day recovery and utilizes secure cloud-based infrastructure hosted at Verizon Terremark’s NAP of the Americas. In the event of an emergency, you will be able to access and restore a client’s critical data to their on-premise and/or cloud-based systems in the event of a failure. Your clients’ data and applications are updated on an ongoing basis and stored in our cloud infrastructure. Backup data is always up-to-date and can be accessed from anywhere, making it convenient for team members who work remotely. When your client leverages our Advanced Online Backup service, their data can be restored within 24 hours, providing your managed services business the opportunity to minimize your client’s downtime. With enterprise-grade cloud-based security from Fortinet, Juniper, and Cisco, your clients’ data and files will always be encrypted and completely secure during data transfers. Because your clients’ backup data will inevitably grow over time, AwesomeCloud ensures that you can easily alter raw computing resources (storage/processing/memory), powering the disaster recover solutions you offer. Need Immediate Access to Critical Data? Does your client require immediate access to data after disaster strikes? If so, one hour recovery is available as part of the High Availability Backup Service. 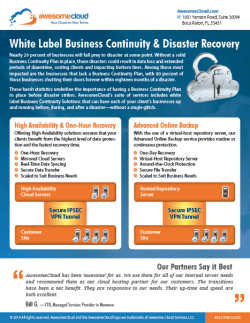 Partner with AwesomeCloud and offer Advanced Backup Services to grow your Managed Services business. Contact us by phone at 855.2.THECLOUD, by email at sales@awesomecloud.com, or by filling out a quick contact form.